Get started or improve with solid basic skills for creating realistic watercolors that glow and pop. Learn to add drama and impact starting with a strong image and using good color choices to make the subject take center stage. Learn color mixing both on the palette and on the paper. Rather than boring exercises, techniques will be learned while actually creating a finished painting. Often called the most difficult of mediums, there are plenty of tricks and tips in watercolor to help correct mistakes and re-work an area that is less than the desired result. Class format is a step-by-step process that incorporates demonstrations of one section of the painting at a time throughout the class time. Photos of the subject matter are provided and every student will be painting the same painting. You may also work from your own photos if you prefer. Each student will receive one-on-one guidance along the way. Bring your enthusiasm and go home inspired. 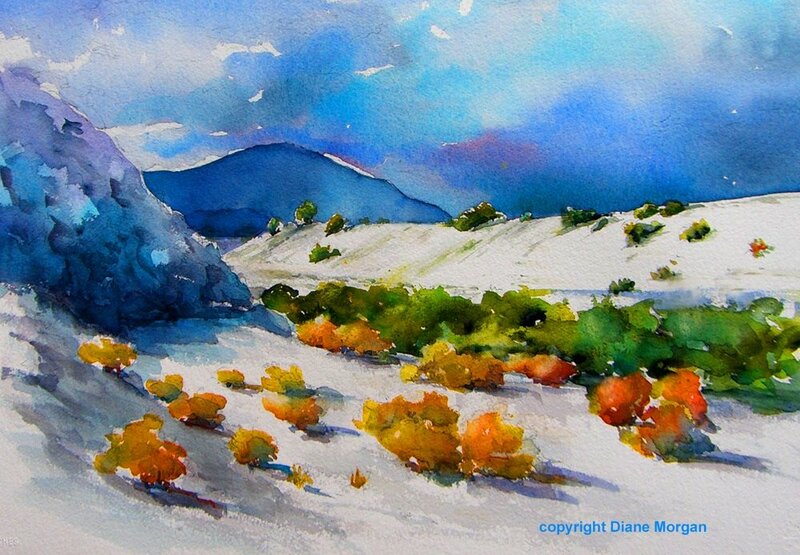 Diane Morgan is an award-winning artist working in watercolor and oil. Her work has been featured in American Art Collector, International Artist, Southwest Art, American Artist, Artist Magazine, Sunset Magazine, Art Patron, Palm Springs Life, The Art of Watercolor and Watercolor Artist. Diane is a member of Oil Painters of America, the California Art Club, the International Guild of Realism. American Watercolor Society, Transparent Watercolor Society of America, an award-winning member of the National Watercolor Society, and past president of the Coachella Valley Watercolor Society. Her audience includes the California Senate, Kaiser Permanente Foundation, Starbucks at the Palm Springs International Airport, museums, galleries and private collections across the United States and Canada. She holds a Bachelor of Fine Arts Degree from the University of Michigan, major in painting.